Should I Update My Mac to 10.11.4? UPDATE: They’re up to 10.11.5. Here’s my article on updating to 10.11.5. I’ve been testing 10.11.4 here since the day it came out and I haven’t had a single problem. I also have not seen any issues in the field. I warned you about 10.11.3 and encouraged you to wait for 10.11.4, and here it is… so go ahead and update– but do it the “pro” way for best results. Restart your Mac. If any apps start up, quit them. We want to make a nice clean environment for the installer. Look for a little menu if you need to change the language from English to something else. Download and install the Combo Update. The Mac will restart when it’s done. You are probably wondering “What’s a combo update?” Great question. 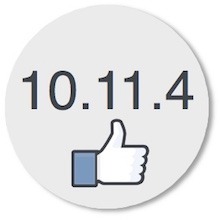 The answer is, it’s everything needed to take 10.11.0 to 10.11.4. That means it’s a bigger, more complete updater than the one you’d get by using Apple’s regular software update mechanism, because the regular updater contains only the stuff needed to get you from the system you’re currently on to 10.11.4. That is, if you’re on 10.11.3, and you’re updating to 10.11.4, Apple installs only those parts needed to make the small jump from .3 to .4. The Combo Updaters have the parts needed to take you from .0 to .4. More stuff means more chances to fix problems that may have cropped up along the way. If I were you I’d do the Combo Update every time. Note: If you’ve already installed 10.11.4 the easy, automatic, click-the-install-button-when-it-pops-up way, you can still apply the Combo Update. It won’t make things worse, and there’s a chance it will make things better. Seasoned Mac pros sometimes apply a combo update to a machine that seems a little bit “off,” and sometimes that makes things better. Not always, but sometimes. It’s worth trying. If you are not on 10.11 at all, but rather on 10.10 or lower, we have some thinking to do. The change from 10.10.x to 10.11.x is not going to throw you off much, and almost everything that works in 10.10.x will work in 10.11.x, and you do get some new things in 10.11, so if you’re on 10.10 and you’re wondering about 10.11, my advice is upgrade to 10.11. This kind of upgrade (from one system to another) has to happen via the Apple menu/App Store method. There’s no “Combo Update” to take you from 10.10 to 10.11. If you’re on 10.8, I would not advise upgrading to 10.11. It will probably be too much for your machine, resulting in slow performance. Is the disk in good shape? Is there room for the update? 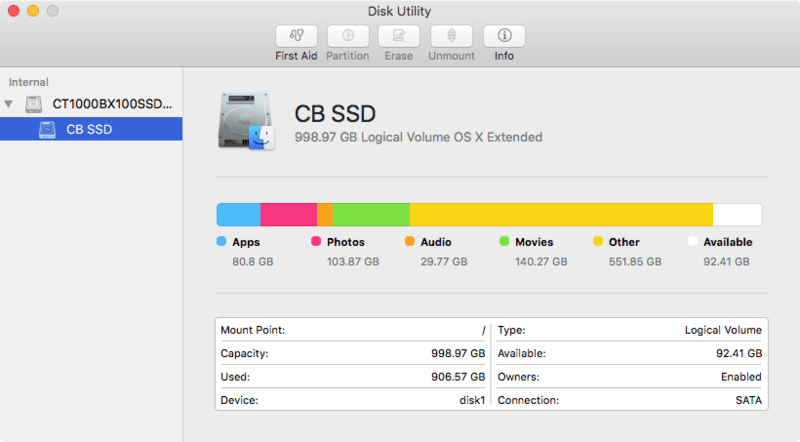 Use the Disk Utility (in your Utilities folder, in the Applications folder) to run First Aid, and while you’re in there look at how much room is available. You should have at least 10% free. I was right on the edge– time to throw a few things away! 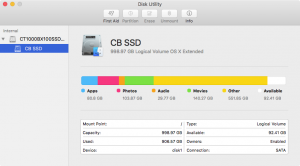 Disk Utility. Click for the full-sized image. Do you have 8 GB of RAM (or more)? Look at About This Mac under the Apple menu and find out. If you only have 4 GB your Mac is going to crawl with 10.11. Ask my sister (who upgraded before asking me). You want to have 8 GB, or 16 GB if you can. If your disk is in good shape, and you have a recent backup, and you have enough RAM, and you’ve checked for software incompatibilities, and you’re not trying to make the move from 10.8 to 10.11, then installing 10.11.4 (even from 10.9) is probably fine. Finally, if you have a particular question about updating your system to 10.11.4, use the form on this page to contact me and I’ll do what I can to assist you. How to delete an email from your iPhone with a single swipe! Should I Update my iPhone or iPad to iOS 9.3?